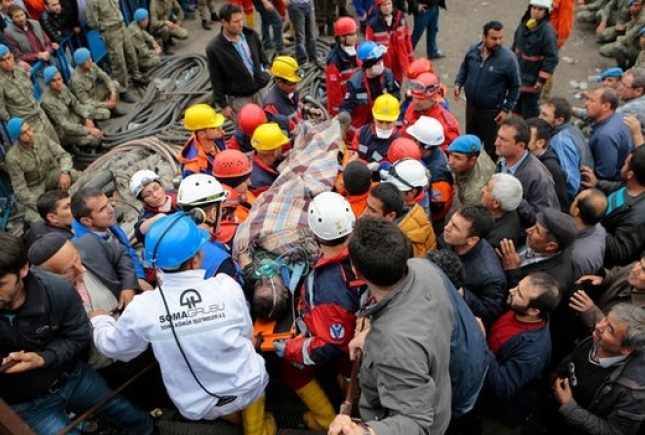 284 miners have lost their lives in Soma, Manisa in a mine owned by Soma Coal Inc. The death toll is expected to rise and there is a high number of casualties. We send our condolences to the working class and the families of the deceased, and wish a speedy recovery to the injured. We cannot call what happened in Soma an accident like the Government representatives are trying to. On the contrary, not an accident or fate this is a real massacre! According to figures, during the 12 years of AKP rule, over 14.000 workers have lost their lives. The Soma Massacre has become the pinnacle of these murders. All these murders are a result of an anti-labour a policy. The neo-liberal policies by the AKP government, as well as those before them; privatisation, subcontracting, increased workload with reduced number of workers, increased exploitation in the name of improved performance; these are all reasons for these murders. A motion to set up a ‘Committee of Investigation’ due to frequent deaths at Soma Coal Inc., put forward by MPs from the political parties of CHP, MHP and BDP, was defeated in the Parliament (TBMM) by AKP MPs votes only 20 days ago. The parliamentary question by HDP Istanbul MP Levent Tuzel was practically dismissed by the relevant ministry, stating that workplaces are regularly inspected. The managers at the mine where the Soma Massacre took place have praised the virtues of privatisation, enabling them to reduce the price of coal by 60%. This must be how the cost of coal must be reduced! Reducing the number of workers, increasing workload, getting rid of experienced workers to replace them with cheaper, less experienced workers, employing ignorant, inexperienced workers through sub-contractors, preventing unionisation and depriving workers of their basic rights, reducing expenditure on security in the name of reducing costs, breaching worker security and health regulations, close relations with the ruling party leading to avoiding inspections, etc. ; these are the practices they boast about in the name of cost reduction and they led to this blatant massacre. Murders at work and this last massacre obviously are not fate. Murders at work will stop only when the bosses drive for profit and indulgence in exploitation stops. Our party is working to end the system of exploitation. We are very sorry for the worker friends we have lost. The best thing we can do for them now is to unite against exploitation and raise the struggle against it. We call on the government to give up policies that are against workers. The Energy and Natural Resources Minister and the Work and Pensions Minister should be the first to immediately resign. Those responsible should be sentenced and given the severest sentences. The legislation, currently inadequate to secure worker health and security, should be reviewed; workplaces should be inspected by experts on workplace security. Serious penalties should be introduced for bosses of companies that do not meet the necessary worker security and health measures. We call on workers and unions to protest the Soma Massacre with strikes and rallies. We should not let such a massacre be swept under with messages of condolences. As a country, it is the right time to reach for the switch and stop life in order to prevent such future massacres.